'C' Coy, 1/8th Bn, The Worcestershire Regiment, 144th Brigade, 48th Division, B.E.F. 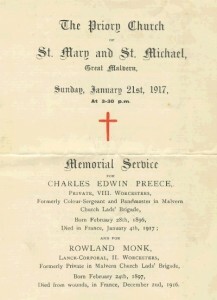 Charles Preece was born in Solihull, Warwickshire on 28 February 1896 and was educated in St Ewe, Cornwall. 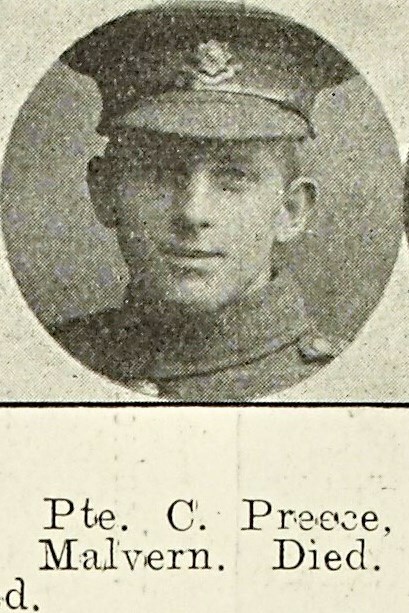 He enlisted into the army on 6th May 1915 and joined the 8th Worcestershire Regiment. 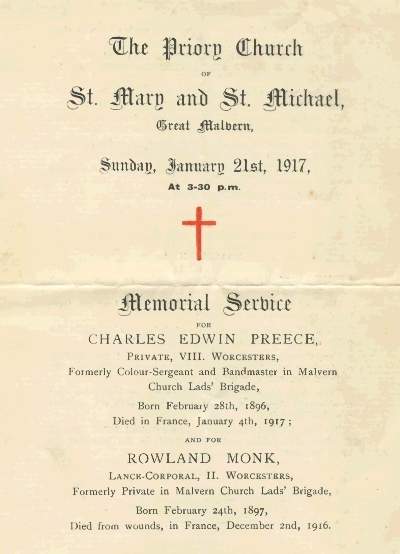 He landed in France on 4th June 1916 and served on the Somme with the 1/8th Battalion and was gassed on the 20 July 1916, along with some five hundred others in the Battalion and after several weeks was evacuated to a Convalescent Depot at Cayeux. He rejoined the Infantry Base Depot ready for service again at the front. However it is not clear whether he served with the Battalion again, before he was evacuated sick to the large base hospital complex at Etaples. At this service Psalms 15 and 25 were sung, the lesson was taken from the Chapter 21 of the Book of Revelations, prayers were said for the fallen, the congregation sang the hymn Ten Thousand Times Ten Thousand, In Sparkling Raiment Bright and the service concluded with the Blessing and the singing of the National Anthem.